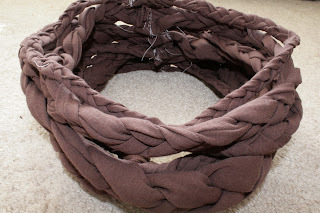 According to pinterest, I pinned the inspiration for this project 29 weeks ago. Oops. Sometimes it takes me a while to get around to projects. The scarf came from a German (!!!) website, but couldn't be purchased. That meant I had to make my own. 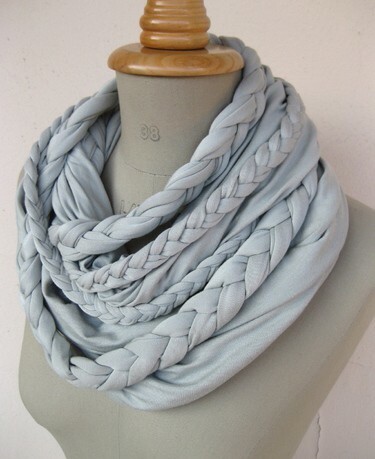 Now, in the original version there is a regular scarf underneath and then braids are simply added. 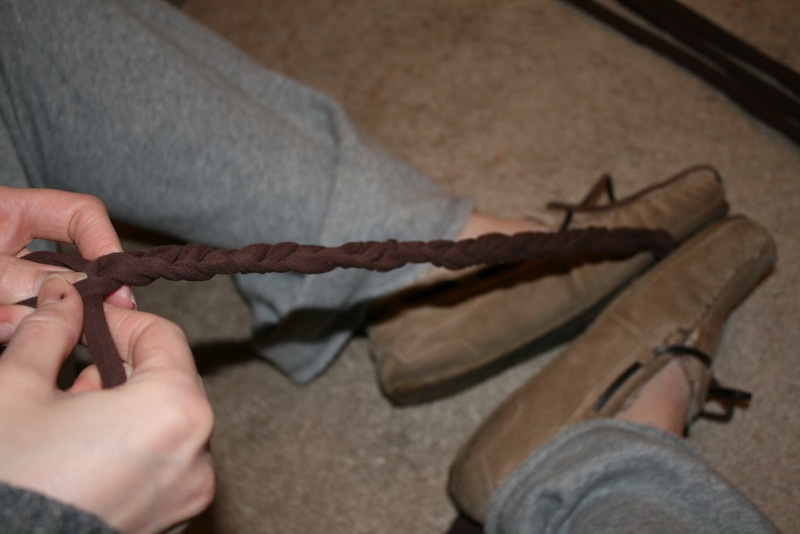 You can definitely still do that (and I'll tell you how), but for mine I made the entire thing braided. 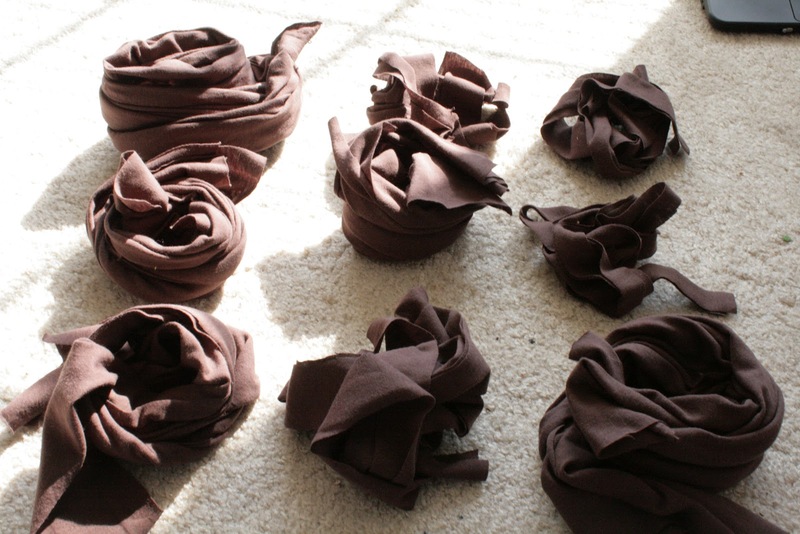 I had a lot of chocolate brown jersey left over from my DIY WRAP BEACH COVER UP, probably 1/2 yard of 50 inch fabric. That was enough, I think. You can decide if you want yours to be heavier or lighter. (1) Cut it. Cut out strips of jersey, 1- 1.5 yards long by 1,2,3 & 4 inches wide. You'll want to make them in sets of 3 so that you can braid them. (2) Braid it. 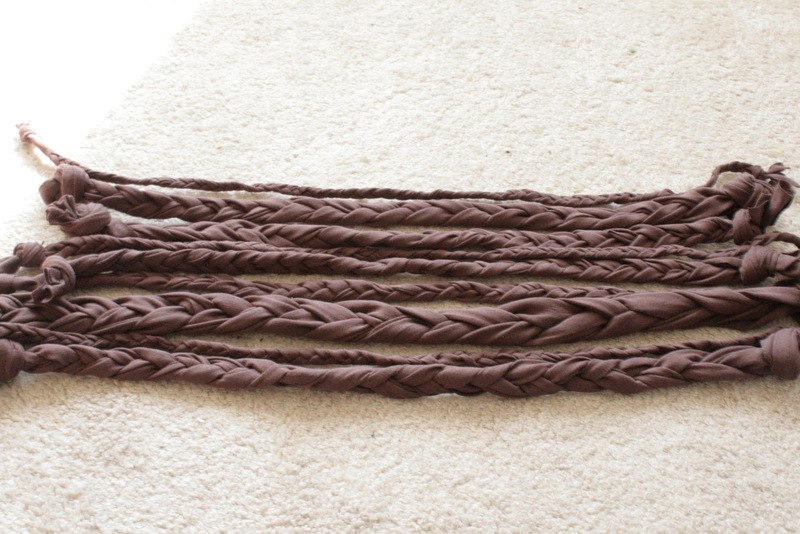 Start braiding your sets of strips. 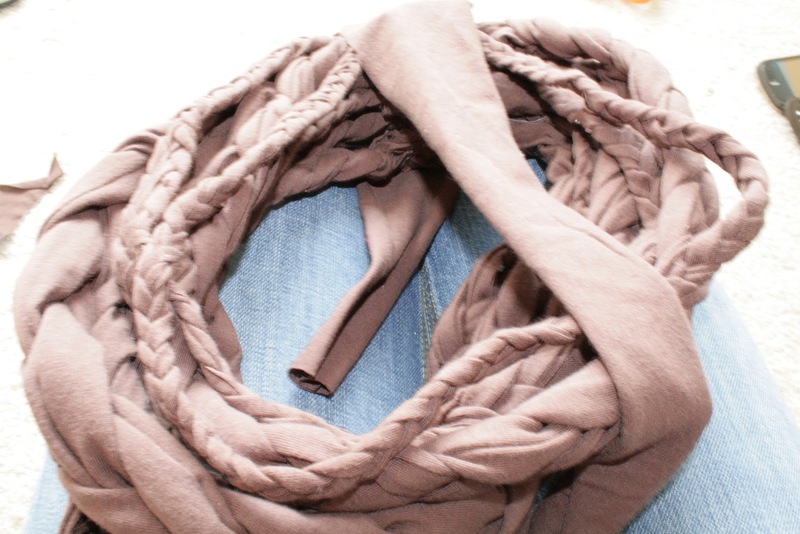 I tied a (loose!) 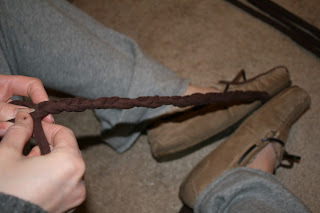 knot in one end, held it between my feet and braided that way. 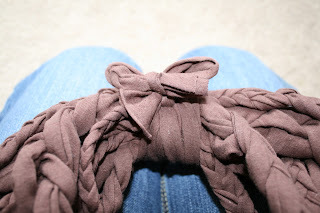 Loosely knot the other end. (3) Stitch it. Stitch the braid ends together to make circles out of them, trim the ends. You may want to do them in varying lengths so that you can have the scarf lay well. 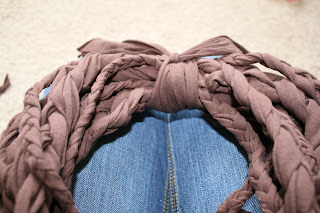 You want them to be able to fit over your head still, but looser at the bottom and tighter at the top. I didn't do that, but I wish I would have. Remember to use matching thread. 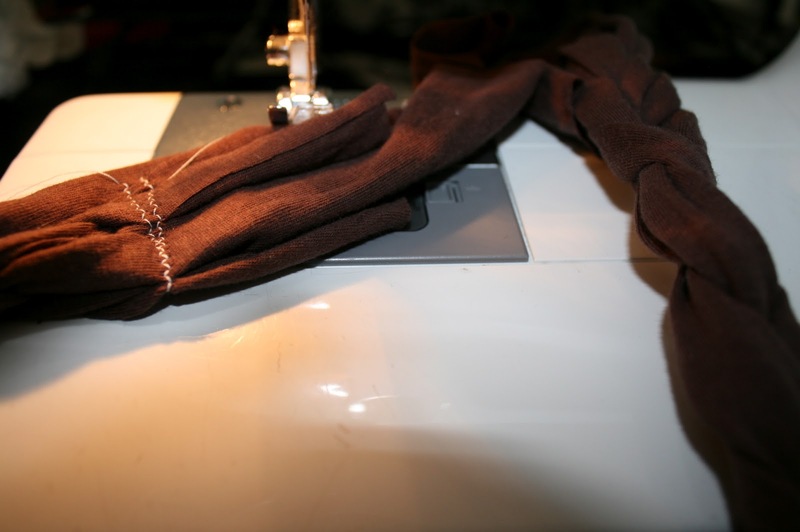 I always use a contrasting color to make the stitches more visible for the post. (4) Secure it. RESERVE A PIECE of jersey for this. 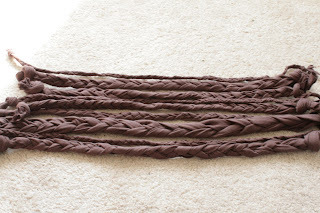 Stack your braids on top of each other (with the shortest section on top if you made different lengths) with the seams all in a line. Take a long piece of jersey and wrap it around the seams to hide them. Finish it off by either knotting and cutting the excess off (being sure to have the knot facing the inside) or by leaving the ends long or tying them into a bow (with the knot facing the outside). If you want to copy the inspiration exactly, start with a very wide (20 inches) piece of jersey and cut it down to fit over your neck. Angle it so that it's looser on bottom and tighter at the top. 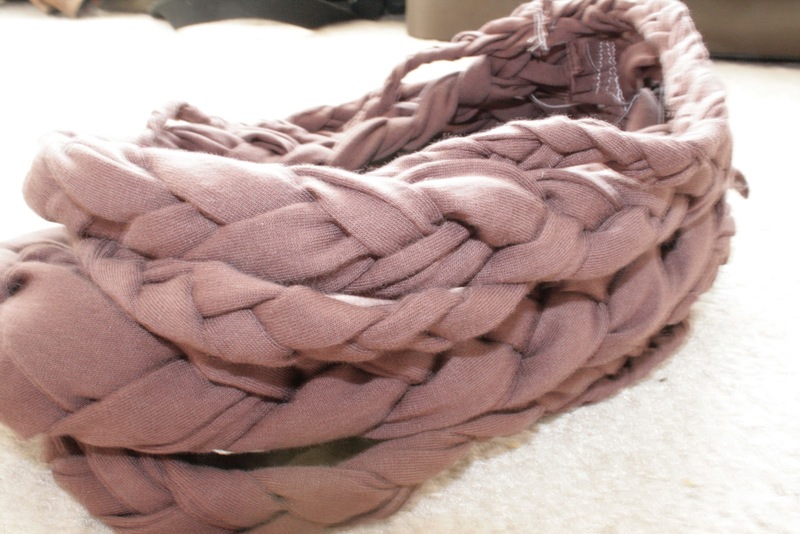 Set it aside and braid your little braids. Then you can either sew the braids into the seam as you connect the ends of your wide piece of jersey OR you can sew the ends of the jersey together, finish the braids as directed above, lay them over the jersey and then secure with a piece of jersey as above. I should probably do another tutorial for this way, because it sounds a bit confusing without pictures! 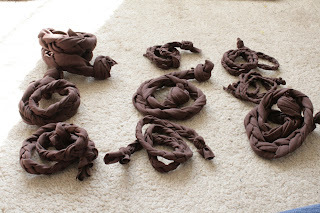 Here's my TUTORIAL for the exact scarf. This project is free for personal use is not to be distributed/republished without my consent. If this inspires a project for your own blog, that is awesome! But please remember to link back to my original post. Please do not copy this text, use the images or steal this idea for any publications. Thanks for promoting the freedom to INSPIRE!